Snapchat is one of the most popular social media platforms, with 191 million daily active users. On average, a Snapchat user visits the platform 18 times in a day. This exceptional user base and daily engagement make Snapchat an ideal platform for you to promote your brand. The platform offers you an effective way to access the demographics you might not reach otherwise and boost your sales. The platform is particularly favored by the teenagers in the US, with 47% of them preferring Snapchat over other channels. As a business owner, you must ensure that your target audience aligns with Snapchat users. Once you do that, you need to find ways to leverage this exceptional platform. Although promoting a business on Snapchat is one of the most resourceful and cost-effective strategies for businesses, it isn’t easy. One of the best ways to leverage the full potential of this platform is using Snapchat tools. These Snapchat tools, with their unique features, provide added functionalities which makes the platform much more productive. Let’s take a look at 12 of the best Snapchat tools that will help you grow your brand’s following and improve your Snapchat marketing. 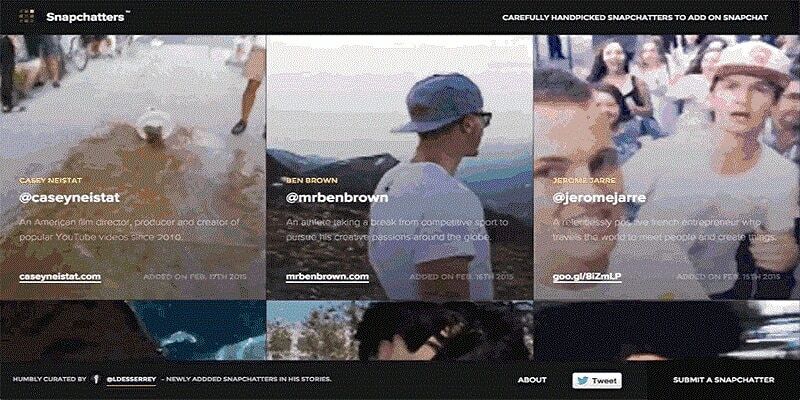 Storyheap is one of the most interesting Snapchat tools that helps you manage your Stories. The tool offers a large number of customizable templates that allow you to create outstanding Stories straight from your dashboard. With its tracking metrics feature, you can analyze how your Stories are performing. You can also view individual reports; and upload, schedule, and publish your Story directly from the tool. The app offers easy and automatic publishing options on different platforms. Pepper Filters is a Snapchat tool that allows Snapchat users to quickly create amazing geofilters. The affordable filters allow you to customize your photos according to your special requirements. The tool offers a wide range of easy to use backgrounds, templates, text effects, and graphics that let you add a zing to your unique event pics. The filter can be used by anyone Snapping within the range of 30,000 square foot circle which makes it ideal for house parties, bars, small/parts of event venues. What more? The filters are pre-tested and already approved by Snapchat. You just need to download the geofilter and submit it to Snapchat. Fastory is one of the best Snapchat tools that help brands and marketers with their storytelling campaigns. The platform helps you design customized Stories that are optimized specifically for mobile devices. The wide selection of interesting elements offered by the internet app help to create fascinating branded Stories that drive engagement, enhance awareness, and take your brand marketing to the next level. One of the most useful Snapchat tools is Delmondo. Delmondo is a convenient platform that offers an in-depth analysis and reports on all of your social media content across various channels. The advanced filters helps to measure and compare your performance on individual social media channels and asses the value gained from your campaigns. Delmondo also helps you save time and effort by automating and sharing campaign reports with your clients. FilterPop is one of the most practical Snapchat tools that helps you find new individuals on Snapchat easily. FilterPop is a Snapchat Geofilter graphic station shop. Find, edit, and start your geofilter on Snapchat all in one place. Snapchat itself is quite limited compared to platforms like Facebook and Instagram. It isn’t easy to find people to follow on Snapchat. One of the best Snapchat tools that can help is FilterPop. FilterPop helps you create different geofilter designs to expand your Snapchat list by associating with relevant Snapchat creators and influencers. Mish Guru is a web-based Snapchat tool which provides a management and analysis dashboard. It allows you to create and upload Snapchat content, schedule it for release, and provide a set of profiling tools. You can automatically capture incoming Snaps and add them to the Story or post them to other social networks. This application can help you discover new customers and influencers. Snapchat Ads Manager is a popular tool that helps you reach Snapchatters through 10 seconds vertical full-screen video ads on Snapchat. The tool helps you design, manage, and run your advertising campaigns from start to finish. They offer a range of options that help you reach and engage your audiences in an interesting way. You can also measure your campaign results. It’s easy-to-use and easy-to-share features make it one of the leading Snapchat tools available online. Snaplytics is an extensive Snapchat analytics and publishing tool. As one of the most comprehensive third-party Snapchat tools, it gives you real insights and analysis to help you manage your Snapchat Story content. This intriguing tool will track and measure the performance of your Stories and help you gain insights into your followers. It will organize your Stories, compare performances across multiple accounts and platforms, and generate regular reports to ensure that you stay on top. The option to upload and schedule Stories saves considerable time and ensures that you do not miss any opportunity. This is a curated list of Snapchat users and also of their Stories on Snapchat. These names can be submitted by anyone, and only the best are added to the list. If you want to find some inspiring users to follow, then Snapchatters is a suitable tool for you. As one of the most exciting Snapchat tools, it helps you find new individuals via random discovery. Unlike Ghostcodes, the tool allows you to find and add new people without applying any specific variables. Geofilters are a fun and interesting way to make your photographs exciting. One of the most popular Snapchat tools, Geofilters allows you to customize your own filters and lenses. Brands and individuals can purchase their own specific Geofilters for their different events, parties, or for a specific location. With Geofilters, you can make your important photographs more compelling by adding a frame or make them more dramatic by adding artwork to them. The application also allows you to create some free filters and share them with others. Snapchat tools are not only interesting but useful too. One of these handy Snapchat tools is Snapcode. A Snapcode is a customized Snapchat code like a QR code. The tool allows users to create a unique Snapcode for their names or brands. Snapcode is like a Snapchat’s follow button. You can spot Snapcode as the usual Snapchat button with random dots in it. With Snapcodes, you do not need to find and type the username of people you want to follow. You can just use this amazing Snapchat tool to scan anyone’s Snapcode with your camera and you are done. This person automatically gets added to your friends list. The tool is also useful for businesses as it is an effective way to promote your website and brand. This Snapchat tool offers another way to promote your Snapchat account. The unofficial Snapchat Button is an embedded button for your website so people can follow you with it. The unofficial Snapchat Button website provides a code that lets you create a button. This button can be pasted anywhere on your website. It allows your followers to easily find you. Therefore, it is one of the best Snapchat tools for bloggers and entrepreneurs. Also, it helps you target your supporters with the right Snaps in the least demanding way. If you are sincere about long-term success, you need to focus on increasing your customer base and brand visibility on social media. Cultivating a Snapchat following offers a great way to build a following that can be harnessed to improve revenue. Each of the above tools has a few specific features that will help you communicate better with your audience. These Snapchat tools are easy-to-use and are used by many successful businesses worldwide. Reflect on your business goals and analyze the features associated with each tool outlined above. Choose the ones that will help you cut through the competition and raise brand awareness. Do you think we missed an important Snapchat tool? What tools have you used to enhance your Snapchat marketing? Let us know in the comments section below.